Justine Nield (L) and Lisa Middlecote (R) with their VIP Adele tickets. 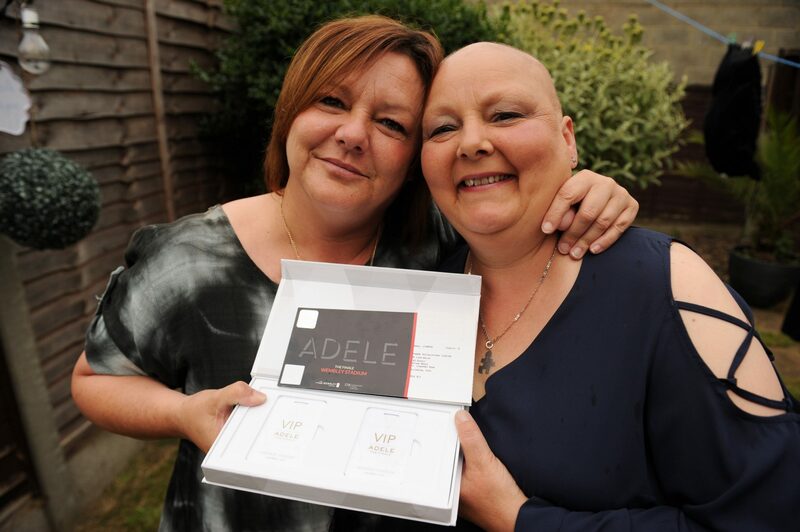 A terminally ill grandmother left devastated by an Adele ticket scam will fulfil her bucket list wish to see the star live after a businessman gave her VIP passes. Cancer sufferer Lisa Middlecote was heartbroken when she bought two tickets for £440 – before realising she had been caught out by callous scammers who had set up a fake website. But a selfless businessman has now handed 49-year-old Lisa, who may not live until Christmas, two VIP tickets so she can go to the concert with her sister and create a “lasting memory gift”. An emotional Lisa, 49, said: “I’ve got a smile from ear-to-ear, unbelievable, unbelievable. “It’s absolutely colossal, I can’t believe there are such kind people out there. It’s reassuring to know there are still beautiful people out there, I can’t believe someone has done this for us. “For someone to step forward was amazing, and obviously I couldn’t go another time. The mum-of-two, who suffers from small cell lung cancer, had found the first batch of tickets on website has since been shut down by the scammers. Her sister Justine Nield, 45, said Lisa had been ‘so proud’ because it was the first time she had ever bought anything online. But she later realised it was a hoax after repeated calls and emails to the website went unanswered – and the tickets were billed for a concert at the O2, when Adele is actually playing a show at Wembley. After reading about their misfortune, businessman, Liam Walsh, handed over two of his own tickets. The sisters will be seeing Adele on Saturday night at Wembley Stadium – using VIP tickets which include luxury seating in the exclusive Bobby Moore club, pre-concert drinks and Champagne, an evening meal and invitations to a post-show after party. Lisa found the fake tickets after another patient at a chemotherapy session searched for them on her phone after they talked about how seeing Adele in concert was on Lisa’s bucket list. Several online forums include mentions of goticketsUK.com by a number of disappointed customers who also say they have lost money by buying tickets that have never arrived. The website, which has since disappeared from the internet, is currently being investigated by the National Fraud Intelligence Bureau after receiving several reports from people who say they have been duped by the site. Lisa added: “I never expected anyone to come froward and help us, I just wanted to warn the public that these websites are out there and these scum exist. Her other bucket list activities included a London tour and an extreme sport experience which the sisters have already enjoyed. Next up is a 50th birthday party on August 17, almost a year after doctors told her she was terminally ill.
Lisa, who is also a grandmother-of-one, is a keen Ed Sheeran fan and would love to see him perform as well. Previous articleThe first Wine Airport in the world, in Moldova!